Bring two cups of sugar, 1/2 c of cocoa ,1/2 c of milk and 1/2 c of butter to a full boil. Remove from heat and add 3 1/2 cups of quick oatmeal and 1/2 tsp vanilla. Mix and drop spoonfuls on to wax paper. Let cool. Enjoy! It’s hard to believe my favorite holiday is only a few weeks away – Christmas. This week I managed to finish all of my Christmas shopping for friends and family along with planning some unforgettable recipes to share with all of them. December is a month of various Multicultural holidays. There are some wonderful holiday customs carried out all over the world, but also many delicious desserts, I would love to share a few with you. In French Happy/Merry Christmas is ‘Joyeux Noël’. In France, Father Christmas / Santa Claus / St. Nicholas is called Père Noël (Father Christmas). The main Christmas meal, called Réveillon, is eaten on Christmas Eve/early Christmas morning after people have returned from the midnight Church Service. Dishes might include roast turkey with chestnuts or roast goose, oysters, foie gras, lobster, venison and cheeses. 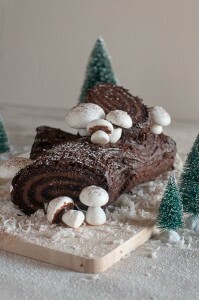 For dessert, a chocolate sponge cake log called a bûche de Noël (Yule Log) is normally eaten. In Sweden, presents might be brought by Santa called ‘Jultomten’ or by gnomes/elves called ‘Nissar’ or ‘Tomte’. They’re called Nisse’ in Norway. 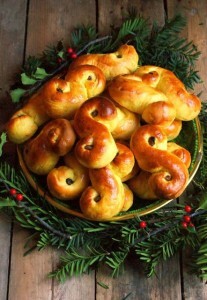 Around Christmas time in Sweden, one of the biggest celebrations is St. Lucia’s Day (or St. Lucy’s Day) on December 13th. The celebration comes from stories that were told by Monks who first brought Christianity to Sweden. St Lucia was a young Christian girl who was martyred, killed for her faith, in 304AD. The most common story told about St Lucia is that she would secretly bring food to the persecuted Christians in Rome, who lived in hiding in the catacombs under the city. She would wear candles on her head so she had both her hands free to carry things. Lucy means ‘light’ so this is a very appropriate name. A popular food eaten at St. Lucia’s day are ‘Lussekatts’, St Lucia’s day buns flavored with saffron and dotted with raisins which are eaten for breakfast. On Christmas Eve, it’s common that no meat (and also sometimes all dairy) is eaten. Often a light seafood meal is eaten people go to the Midnight Mass service. The types of fish and how they are served vary between different regions in Italy. For many Italian-American families a big Christmas Eve meal of different fish dishes is now a very popular tradition! It’s known as The Feast of the Seven Fishes (‘Esta dei Sette Pesci’ in Italian). The feast seems to have its root in southern Italy and was bought over to the USA by Italian immigrants in the 1800s. It now seems more popular in America than it is in Italy! When people return from Mass, if it’s cold, you might have a slice of Italian Christmas Cake called ‘Panettone’ which is like a dry fruity sponge cake and a cup of hot chocolate! In Greek Happy/Merry Christmas is ‘Kala Christougenna’. On Christmas Eve, children, especially boys, often go out singing ‘kalanda’ (carols) in the streets. They play drums and triangles as they sing. Sometimes they will also carry model boats decorated with nuts which are painted gold. Carrying a boat is a very old custom in the Greek Islands. If the children sing well, they might be given money, nuts, sweets and dried figs to eat. The main Christmas meal is often Lamb or pork, roasted in an oven or over an open spit. It’s often served with a spinach and cheese pie and various salads and vegetables. 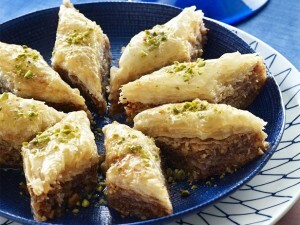 Other Christmas and new year foods include ‘Baklava’ (a sweet pastry made of filo pastry filled with chopped nuts and sweetened with syrup or honey), Kataifi (a pastry made from a special form of shredded filo dough and flavored with nuts and cinnamon), Theeples (a kind of fried pastry). 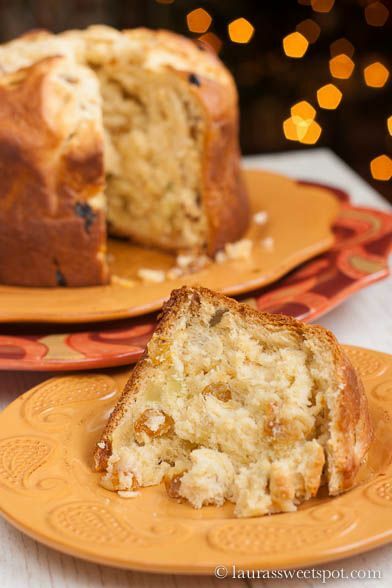 Another popular Christmas dessert are melomakarono, egg or oblong shaped biscuit/cakes made from flour, olive oil, and honey and rolled in chopped walnuts. In Japanese Happy/Merry Christmas is ‘Meri Kurisumasu’. In Japan, Christmas is known as more of a time to spread happiness rather than a religious celebration. Christmas Eve is often celebrated more than Christmas Day. Christmas Eve is thought of as a romantic day, in which couples spend together and exchange presents. In many ways it resembles Valentine’s Day celebrations in the UK and the USA. Young couples like to go for walks to look at the Christmas lights and have a romantic meal in a restaurant – booking a table on Christmas Eve can be very difficult as it’s so popular! Fried chicken is often eaten on Christmas day. It is the busiest time of year for restaurants such as KFC and people can place orders at their local fast food restaurant in advance! The traditional Japanese Christmas food is Christmas cake, but it’s not a rich fruit cake, but is usually a sponge cake decorated with strawberries and whipped cream. I hope you enjoyed this “sweet” trip around the world…Let the holiday baking begin! Butter and line two 8 or 9-inch cake tins with parchment paper. Using a standing mixer, beat the butter, sugar and lemon zest until it becomes pale and fluffy. Add the eggs one at a time, beating well. Then fold in the flour, one spoonful at a time, and blend until well combined. Divide the mixture evenly between the 2 cake tins and level off with a knife. Bake for 20 minutes until the sponge cakes are well risen, golden brown and firm to the touch. Run a rounded butter knife around the inside edge of the cake tin and carefully turn the cake out onto a cooling rack. Meanwhile, hull the strawberries and slice them in half. Whip the cream, icing sugar and vanilla until it becomes quite stiff. 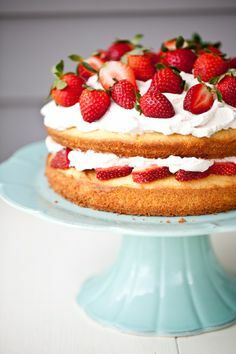 When the cakes are cool, spread the jam on one of the sponge cakes and spread half of the whipped cream on top. Place half of the strawberries on top of the cream. 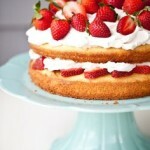 Place the other sponge cake on top and spread with the remaining whipped cream. Arrange the remaining strawberries in a spiral round the top of the cake. Position a rack in the lower third of the oven; preheat to 350 degrees F.
Combine the nuts, cinnamon and ground crackers in a bowl. Brush a 9-by-13-inch baking dish with some of the butter. Layer 10 pieces of phyllo in the dish, brushing each piece with butter before adding the next (keep the remaining dough covered with a damp towel). Sprinkle a quarter of the nut mixture over the dough. Layer 4 pieces of phyllo on top, brushing each with butter before adding the next; sprinkle with another quarter of the nut mixture. Add 4 more phyllo pieces on top, brushing each with butter, then add another quarter of the nut mixture, 4 more pieces of phyllo with butter, and the remaining nuts. Layer the remaining 10 pieces of phyllo on top of the nuts, brushing each with butter; brush the top piece with extra butter. Cut into the baklava to make strips, about 1 1/2 inches wide. Then make diagonal slices, about 1 1/2 inches apart, to create a diamond pattern. Bake until golden, about 1 hour. Meanwhile, make the syrup: Bring the sugar, honey and 1 1/2 cups water to a boil in a saucepan over medium heat and cook, 10 to 15 minutes. Add the lemon juice and boil 2 more minutes, then let cool slightly. Pour the syrup over the warm baklava; let soak, uncovered, at least 6 hours or overnight. Garnish with nuts. Grease a jelly roll pan (17 by 12 inches) and line the bottom with parchment paper. Grease the parchment paper and flour the bottom and sides of the pan, knocking out the excess. We first need to make a meringue. In the bowl of an electric mixer fitted with whip attachment, beat the egg whites on low, gradually add the sugar and raise the speed to high, beat for about 5 minutes or until stiff peaks form. In a separate bowl, beat the egg yolks and using a rubber spatula, carefully fold them into the meringue. Fold the cake flour into the meringue and last fold the cooled melted butter. Carefully pour the batter into the prepared pan, smoothing it out into an even layer. Bake the cake for 5 minutes, rotate the pan and continue to bake for another 7 minutes or until the center springs back when lightly touched. While the cake is baking, place a clean kitchen towel on a work surface. Place coco power in a sieve and generously dust the kitchen towel evenly. When the cake is done, immediately flip it into the prepare kitchen towel. Remove the pan and gently peel off the parchment paper. Carefully start rolling the cake from the long end into a tight spiral. Keep the cake rolled until it’s completely cooled and really to be filled. In a mixer fitted with a paddle attachment, whip the butter and cream cheese together until creamed. Add the dulce the leche and mix until smooth. Gradually add powdered sugar to the mixture. Add the vanilla and salt and mix for 3 minutes more. Gently unfold the cake and using an offset spatula, lightly coat the surface of the cake with a thin layer of butter cream. With the help of the kitchen towel, carefully re-roll the cake into a tight roll. Transfer the cake to a serving platter before continue with the decoration. Using a serrated knife, cut 1 inch off one of the ends of the log and place the end piece cut side up on top of the log (“glue” it to the log with some butter cream) to resemble cut brunch. 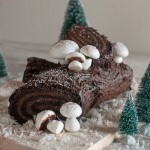 Using the offset spatula, cover the entire log including the ends with butter cream. With the help of a fork, score the log in long even lines to resemble tree bark. 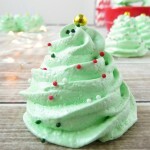 Decorate the cake with mushrooms meringues (this is the fun part so enjoy it!) and last but not least, let it snow!! 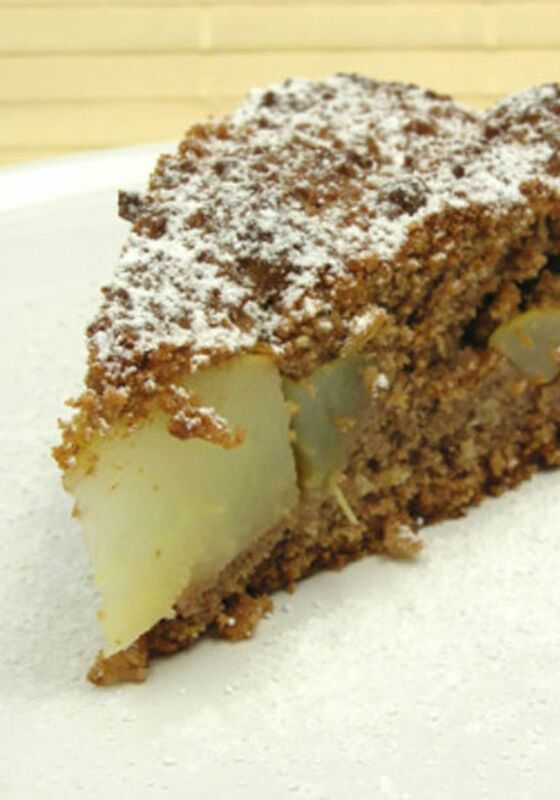 Dust the cake with confectioners’ sugar!! Preheat the oven 200 F.
Beat the egg whites with lemon juice until stiff peaks form. Add the sugar one tablespoon at the time mixing well after each addition. Mix until whites are stiff and glossy. Transfer mixture to large pastry bag fitted with 1/2-inch plain pastry tip. For the mushroom caps: Pipe domes, 1 to 2 inches in diameter, onto prepared baking sheets, and flatten the tips with your fingers. Pipe stems onto baking sheets. Bake for 1 hour in the preheated oven or until dry. To assemble, spread bottoms of caps with a thin layer of chocolate frosting, carefully insert stem. With your fingers, rub some chocolate frosting on top of each mushroom cap. I served this at Cooking Club and the ladies were so impressed by the easy, yet delectable presentation that they wanted to start with dessert. This is such a quick and easy recipe to whip up for any occasion, yet it will look like you spent hours preparing for your guests. You can modify it for those special dietary needs (see below). You can substitute Neufchatel for the cream cheese to cut the fat; to lower the sugar and calories, feel free to use Stevia instead of powdered sugar and sugar free jam. Also, feel free to substitute strawberries or blueberries if you prefer. Preheat oven to 350°F (180°C). Grease and flour Torte Pans; set aside. Prepare cake mix according to package directions; divide batter equally between pans. Bake 18-22 minutes or until wooden pick inserted in centers comes out clean. Remove from oven to cooling rack, cool 5 minutes. Remove cakes from pans; cool completely. Combine cream cheese, powdered sugar and orange zest in Classic Batter Bowl; whisk until smooth. Fold in whipped topping. Place one cake layer well-side up onto serving platter. Spread half of the filling over cake layer. Place raspberry jam in Prep Bowl. Microwave on HIGH 10-20 seconds or until warm; whisk until smooth. Drizzle half of the jam over filling. Stack remaining cake layer on top of first, well-side up; spread with remaining filling. If desired, arrange raspberries over filling; drizzle with remaining jam. This easy dessert had them licking the bowl during cooking club. I do mean the bowl not just the spoon 😆 . It is one of the quickest and easiest desserts you will ever make. 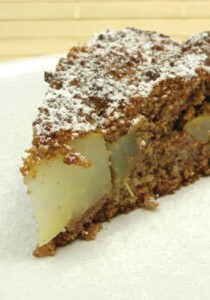 It is a classy dessert that the beginner cook could easily serve. It is the perfect dessert to impress at a dinner party. You don’t have to tell anyone that it was a quick and easy recipe. Mascarpone is just a sweetened Italian cream cheese. It’s a little denser of a product, and it has a silkier, smoother finish. Just like you would whip cream, you’re going to use a stand-up mixer. Add Mascarpone cheese and turn mixer on the lowest setting. Add half a cup of powdered sugar and one tablespoon of vanilla extract . Stop the mixer and with the spatula to scrape down the sides and make sure everything gets smooth and incorporated. And that’s it, mascarpone already is a pretty dense product so you really don’t have to give it much whipping. Mix for a few seconds more and then spoon out just a little dollop right in the middle of the bowl and I use some fresh strawberries right over the top and I just drizzle a little bit of honey. You can taste every strawberry. Feel free to substitute other berries. These truffles make a beautiful recipe to serve during any special occasion. They also make a wonderful gift (think teachers!). These truffles are so quick and easy yet they look like you had to take a culinary class to learn to make them. Truffles are a chocolate lovers delight! Break cookies in half and place into Manual Food Processor; cover and pump handle to form very fine crumbs. Add cream cheese; process until dough forms. Using level Small Scoop, scoop cookie mixture onto Medium Sheet Pan lined with Parchment Paper; roll into balls. In Small Micro-Cooker®, microwave chocolate candies, uncovered, on HIGH 1-1 1/2 minutes or until melted, stirring every 30 seconds. Cool slightly. 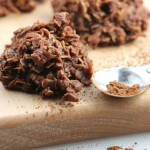 Dip truffles into chocolate; place onto pan. Let stand 5 minutes or until chocolate is set. In (1-cup/250-mL) Prep Bowl, microwave chocolate morsels, uncovered, on HIGH 30-60 seconds or until melted, stirring every 15 seconds. Spoon chocolate into small resealable plastic bag; trim corner of bag and drizzle chocolate over truffles. Let stand 10 minutes or until chocolate is set. Store truffles in an airtight container in the refrigerator. Brush Stoneware Fluted Pan with 1 tbsp (15 mL) of the oil using Silicone Basting Brush. Drain pears using medium Stainless Mesh Colander; blot pears dry with paper towels. Using Utility Knife, slice four of the pear halves lengthwise into quarters for a total of 16 slices. Arrange pear slices in a circular pattern over bottom of pan. Place remaining pears in Food Processor; cover and pump handle until smooth. Spoon pear puree into (1-cup/250-mL) ; add enough water to puree to measure 1 cup (250 mL). In large Bamboo Fiber Mixing Bowl, combine cake mix, ginger, pear mixture, eggs, molasses and remaining 1/3 cup (75 mL) oil; whisk until well blended using Stainless Whisk. Slowly pour batter into prepared pan. Microwave on HIGH 10–12 minutes or until wooden pick inserted near center comes out clean. Carefully remove pan from microwave; cool cake in pan 10 minutes. Center Large Round Platter over pan and carefully invert; remove pan. Drizzle sauce over cake. Cook’s Tip: To bake in a conventional oven, preheat oven to 350°F (180°C). Prepare batter as directed; bake 40–45 minutes or until wooden pick inserted near center comes out clean.